The sedans that Mercedes-Benz brought to the United States from the late Sixties to the late Eighties are justifiably legendary among enthusiasts. We can all recite the highlights: W123. W124. W126. 450SEL 6.9. 500E. 560SEL. W201 190D 2.5. Well, that last one is only legendary because Kool Moe Dee had one. Still, these were automobiles that caused rules about design language and brand identity and human dignity to be shamelessly discarded across the industry. Everybody from Ford (with the Granada) to Lexus (with, um, Lexus) rushed to copy them as best they could. There was one piece of bad that snuck in with all the good, and that was the absolutely ridiculous maze-pattern console shifter for Benzos with automatic transmissions. Because the console shifter was standard equipment on Mercedes-Benz, everybody from the consumers to the competition automatically (get it?) assumed that having a massively complex shift pattern right there on the console was the Only Right Way To Do It. Not everybody went through the trouble of copying the ziggurat labyrinth between "P" and "D" that you got in a 380SEC, but pretty much everybody moved the automatic transmission selector from the steering column or the dashboard to between the front seats. This was, without exception, a remarkably stupid idea. Hold your knee-jerk response to that for a minute and ask yourself: How often do I actually operate the shifter in an automatic-transmission vehicle? Unless you're towing something or trying to hustle a rented Camry around a racetrack, activities of which your humble author is guilty, the answer is usually twice: once when you start your trip, and once when you park at the end. Compare that to how often you operate the climate controls or in-car entertainment controls or the power windows or reach for something in a cupholder. So in exchange for having something that you touch twice a day directly under your hand, you give up a remarkable amount of space and utility. Forget the idea of the middle front seat that used to be standard equipment in every car; nowadays, nobody puts anybody in their car but their ex-wife and their 0.8 children. My grandparents triple-dated with friends in massive de Villes and Eldorados but that was in an era when people spoke to each other. No, what you really want that space for is the combat gear of corporate America. The second cellphone you have because your office isn't BYOD yet, along with its charger. Your tablet and your Kindle. Your Lenovo Yoga flip-fold laptop. The forty-four ounce styrofoam cup of Pepsi that will both shorten your telomeres and last forever in the landfill, a thousand-year testament to your dead self's inability to resist temptation . Your parents went on month-long roadtrips carrying only a crumpled map and a classical education but you have to take five electronic devices and three food items just to pick up your 0.8 children from their aftercare program. There's no room for any of it in your car. It's one thing to put up with this indignity so you can drive a Dodge Viper TA 2.0, but are you really willing to deal with having a 2.1-amp-rapid-charged iPhone 6XXS raising the temperature between your legs to Death Valley levels all day because your center console is devoted to pretending your mid-priced sedan or luxury-equipped CUV has a fake stick shift? The advent of shift-by-wire automatics and double-clutch transmissions has led to all sorts of "innovative" console shifters. The Acura TLX has a bunch of buttons that somehow manage to take up all the space of an old Benz PRNDL. The new Lamborghini Huracan has an odd push-and-pull-and-lift thing going on. The AMG GT has a very small shifter with a "P" button that, I assure you, stands for Park. These are all impressive cars. But if you happen to rent a new Chrysler 200 you'll find that it just has a rotary knob marked PRNDL. It's about the size of a cellphone and it's mounted up on the dashboard away from the center console. It has no Nürburgring credentials and you'll never see Nico Rosberg using it to choke out of the World Championship lead. It's dorky-looking and not masculine or upscale or advanced or exciting . Buy this Craigslist Accord, and you&apos;ll be the one running Bartertown. 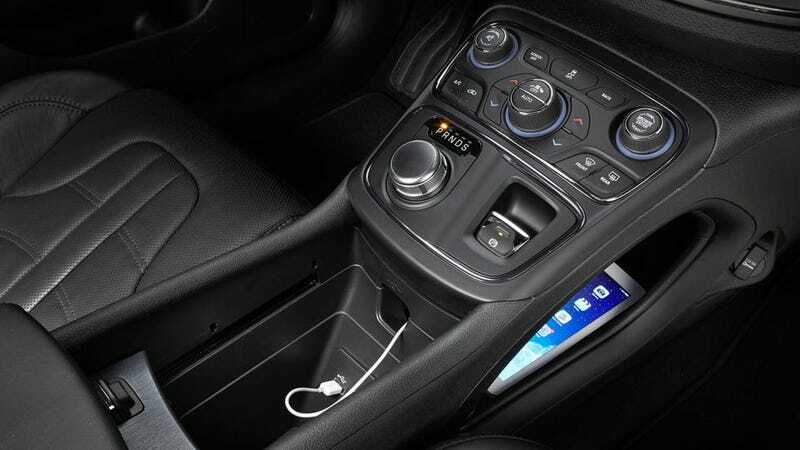 But where the shifter in the Chrysler 200 used to be, there's a pair of massive cupholders that can also slide back to reveal a deep cubby big enough for all of the stuff previously discussed, with the possible exception of an entire 190D 2.5. "That's so rental-car," a friend of mine sniffed, and truth be told, you wouldn't want that humble dial on the console of an Aventador or 458 Speciale. In the real world, however, it works very well and I now want one just like it the very next I buy an automatic-transmission vehicle for personal use, which I hope will be a very long time from now. The rest of the Chrysler 200? Well, that's not as clear-cut a case, but remember: sometimes, you have to take the bad with the good.